A Classic WebWord regular Dennis G Jertz has published an article "Somewhere Nearby is Colossal Cave" tracing the history of Colossal Cave Adventure which was the introduction to computer adventure games for many people of a certain generation. 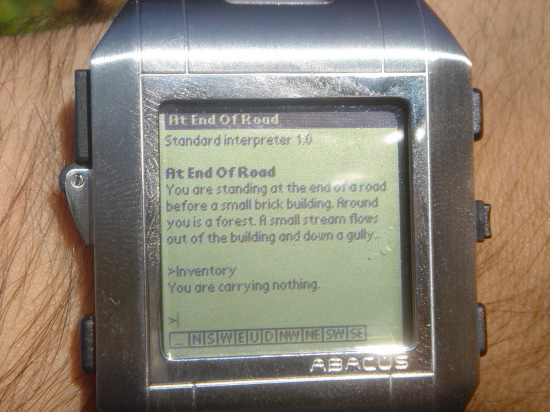 It can now be experienced on a WristPDA. I do wonder if the people who designed Sat Nav systems spend too much time playing this game. Boyd and Ellison have published this usabilie definition of a Social Network Site. They have also published an interesting "Social Network Totem Pole" that illustrates the history of Social Networks. It's interesting to note that the UK site Friends Reunited doesn't appear on the totem pole even though it launched in 2000 and has got ober 15 million members. Let me step back and discuss the future in the context of history. My example comes from Volume II, Plate 55, of the Historical Atlas of Canada . What the plate does is document the introduction of the blackboard into schools in Upper Canada in the period between 1856 and 1866. Now you will be excused if you are now asking yourself, "Why do I care about blackboards in the 1800'sin Canada no less?". Nevertheless, I beg your patience. The key to the example (regardless of year or country) lies in posing the following question: "What preceded the blackboard?" With just a little reflection one will come to the obvious answer: "The slate." But, you might ask, "Is not a slate just a little blackboard? If so, this cannot be very important." Well, from a technological perspective, the answer is yes, slates are just small blackboards. They are made from the same materials, and in the jargon of today, employ the same "user interface", the same "text editor", "operating system" and even the same "erase" operator. Consequently, one might quite legitimately ask, "What is the big deal?" After all, "all" that they did was make a bigger slate and put it on the wall. Well, I would argue that this seemingly "simple" change was a "big deal". In fact, I believe that an argument can be made that the introduction of the blackboard has had more impact on classroom education than any innovation in technology since, including the introduction of cheap paper or the introduction of the internet and personal computers! That may seem like a bold claim. But for my point to work, you only have to concede that this argument is plausible. It need not be true. The gist of the example is to illustrate that a very significant impact resulted from a change in scale, location and usage, rather than a change in technology per se. The change was social and educational, not technological in the common sense of the term. Leaping ahead, this example from the mid-1800's sheds some light on the deployment of technology in today's schools as well. What it suggests to me is that perhaps we should be spending as much time looking into the potential of computer-driven electronic whiteboards, at the front of the class, as we are spending in the seemingly ubiquitous quest to put a computer on every student's desk. However, my perception is that his is not even remotely the case, to the misfortune of future students, I fear. The year was 1994 and it was my Eureka! moment. The internet allowed publishers to display words and pictures just like we did on papers, but without waiting for a print run or a painfully slow delivery system. They weren't compromised by lack of space and they were threatening to offer broadcast material - on demand and at any time. My conversionary zeal was not shared by my colleagues. Most glazed over every time I mentioned the buzzword "internet" and some thought it was a cranky fad. The shrewdest comments came from the newspaper advertising executives who wondered where the revenue would come from. It's a question some are still asking.